I will pick you up from your Hotel and we will make our way to Marahau the start of the Tasman National Park. Here you can enjoy a short board walk around the wetlands area on the edge of the Tasman National Park where you will have an opportunity for some bird watching and some great photo opportunities. 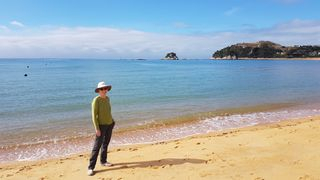 Your private tour then takes you to the beautiful Kaiteriteri beach for a stop at a seaside cafe for coffee/tea. We will then travel through the apple orchards and the hop fields behind Motueka to Moutere Hills Vineyard a family owned boutique vineyard and winery and also has beer and cider for tasting. This is is situated among the picturesque hills near Nelson in the warm and sunny north of New Zealand's South Island. You will finish your afternoon off at the National Wow Museum and Nelson Classic Car Gallery. This is a must see for anyone visiting Nelson. I will then return you to your Hotel.